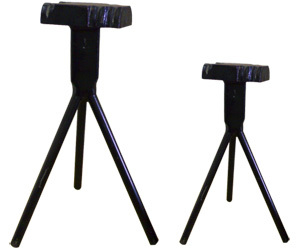 A robust stall jack with useful turning cams, for plating or light cold shoeing. Available in standard height or tall. The hoof stand always wanted to Adjustable height to reduce stress to your back and legs while dressing hoofs and nailing shoes. Interchangeable head assembly... adjustable height, anti-slip hoof rest & optional Hoof Cradle. Compartmented tool bin... keeps tools at your fingertips.